- To help promote long term health and vitality. Sweet potato - A natural source of dietary fibre. Seaweed - A great source of natural trace elements. - To aid healthy digestion. - To help support joint health. Yucca extract - To help reduce stool odour. Cranberry extract - To aid urinary tract health. - To help support a healthy immune system. A complete Food Suitable for Adult Dogs. Chicken With Sweet Potato & Vegetables. *Formulation grain free, manufactured in a site that handles grains. The amounts given are recommendations only, individual dogs requirements will vary dependent upon breed, age and activity levels. Feed to maintain a lean active condition. Remember to introduce a new food gradually over 4 days or so, increasing the proportion of new food daily. Once opened, cover and store in the refrigerator, use within 48 hours. Always provide a supply of fresh, clean water for your dog. Crude Protein 10%, Oils & Fats 9%, Crude Fibres 0.5%. 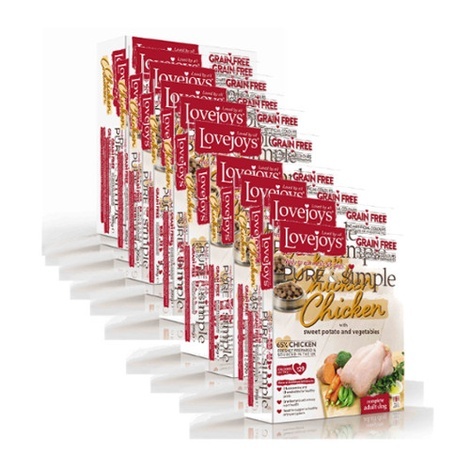 Quantity: Pack of 10 of 395g each.